Keeping your coffee fresh is crucial if you want to enjoy your drink for as long as possible. For this purpose, our expert have selected a wide range of coffee containers (with vacuum system) and airtight preservation containers. Plenty of specialist brands are on offer including Oxo, Tightvac, Melitta, Bodum and Cafés Lugat. 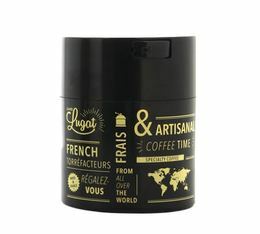 Cafés Lugat storage jar (250g/0.8L). At the press of a button, the air is removed from the container, so your coffee or food is better preserved.